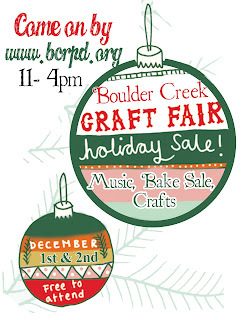 I'm so excited about participating again at this year's craft fair at the Boulder Creek Rec Hall. It's a great time with live music, local artisans, bake goodies, face painting and loads of mountain fun! So come rain or shine and feel the love the locals have to offer. As usual I will have my JamStand stocked with your favorite flavors (and some new ones too) made from locally sourced ingredients and farmers. My Blackberry Merlot Jelly, Strawberry Cabernet Jelly and Fig Merlot Jam are laced with holiday cheer from my favorite local wine by Dancing Creek Winery or try one of four flavors of Heirloom Tomato Jams or my indescribable Bengali Spiced Tomato Chutney made from Love Apple Farms prize tomatoes. My Strawberry Jam flavors like Strawberry Balsamic Fig, my epic Sugar Pie Pumpkin Butter and my lovely Quince Jam & Jelly creations would not be the same without harvests from Crystal Bay Farms nor would my Persimmon Jam, Vanilla Spiced Pear Butter, Curried Apple Chutney be as delightful without the reverent fruits grown by Casalegno Family Farm. Try some of these at the fair! I've got marmalades and lots of spicy jellies, stocking stuffers, gift baskets, and something for everyone on your list and don't forget to get a few jars of sunshine for yourself. See y'all there!